Anville group / Gang of Four (two nicknames from D.Caes for the four bowl-shaped craters Anville, Taruntius H, Taruntius K, and Taruntius P). Apollo Ridge (an informal NASA related name for a (not quite identifiable) formation south-southwest of Secchi, east of Secchi U). Asada (see Additional Information below; Apollo 15's CSM Endeavour over Asada and Taruntius). Cauchy D hills (a nickname from D.Caes for the cluster of hills north-northeast of the bowl-shaped crater Cauchy D, at the western part of Sinus Concordiae) (these hills seem to be sections of an ancient crater, see SLC-A4) (System of Lunar Craters). Coxwell Mountains (W.R.Birt's name for the southwestern part of Mare Crisium's rim). da Vinci (this name was introduced by one of the most mysterious persons in the history of selenography... a certain Peucker) (who was Peucker?) (the crater now known as da Vinci was once J.Hewelcke's Prom. Herculeum). Dorsum Asada (an unofficial name from D.Caes for the wrinkle ridge west of Asada). Dry Gulch (an informal NASA related name for a straight shallow "rille" north of the bowl-shaped crater Secchi K, see Chart 48). Fretum Pacis (Van Langren's disallowed name for the arc-shaped mare region between Taruntius and Asada). Furnace Gulch (an informal NASA related name for an irregular cluster of shallow depressions west of Dorsum Cushman and the Anville group). Gemini Ridge (an informal NASA related name for a wrinkle ridge near Dorsa Cato). James (a disallowed name for Lick F, see Lunar Topographic Orthophotomap 62-A4). Mare Crisium (Van Langren's Mare Caspium (de Moura) (occupying the upper right section of Chart 37) (J.Hewelcke's Palus Maeotis). Mare Fecunditatis (Van Langren's Mare Langrenianum) (the northern part of it, occupying the lower right section of Chart 37). Mishqui Basin (a rare informal name for the flat region north of Abbot, called Mishqui Basin on the Rand McNally moonmap). Mons Corax (J.Hewelcke's disallowed name for the southwestern rim of Mare Crisium). Moreti (Van Langren's disallowed name for Picard Gamma at the southwestern part of Mare Crisium). Mount Marilyn (an informal NASA related name for the triangular mount near the lower left corner of Chart 37, see also Additional Information below) (and also Mark Robinson's very interesting article Mt.Marilyn: Navigating to the Surface). Noether (a disallowed name for Cauchy D, see Lunar Topographic Orthophotomap 61-B4). Palus Somni (Van Langren's Aestuaria Bamelrodia, J.Hewelcke's Lacus Corocondametis). Prom. S. Ignatii (Van Langren's disallowed name for the region south of Sinus Concordiae, northwest of Lawrence). Prom. S. Michaelis (Van Langren's disallowed name for the region southwest of Taruntius) (Montes Secchi). Rimae Apollonius (called Fossae Apollonius on Lunar Topographic Orthophotomaps 62-D1, 62-D3, 62-D4). Rimae Secchi (called Fossae Secchi on Lunar Topographic Orthophotomap 61-C4) (also called Apollo Rille during the hey-days of the first Apollo missions). Rimae Taruntius (called Fossae Taruntius on Lunar Topographic Orthophotomap 61-C2). Sarmatiae Asiaticae pars (J.Hewelcke's disallowed name for the region south of Mare Crisium). Sinus Concordiae (J.Hewelcke's Sinus Caucasius). Smokey Basin (an informal NASA related name for Lubbock S east-southeast of Mount Marilyn). Taruntius (see Additional Information below; Apollo 15's CSM Endeavour over Taruntius and Asada). Terra Vigoris (Riccioli's discontinued name for the region between Mare Crisium at upper right and Mare Fecunditatis at the lower part of Chart 37). Twin Craters Ridge (an informal NASA related name for the elevated eastern part of an officially unnamed crater about halfway between Mount Marilyn and Secchi). Weatherford (an informal NASA related name for an irregular crater northwest of Mount Marilyn). The southern part of this region was frequently photographed during most of the Apollo missions. Especially during the docking sequence of Apollo 15's Command/Service Module (Endeavour) with the Lunar Module (Falcon). Several books on manned spaceflight show mostly one of the well-known orbital photographs of the exposed SIM-bay in Apollo 15's CSM Endeavour with crater Taruntius and the moon's curved horizon in the background. One of those photographs (AS15-88-11972) shows CSM Endeavour "between" craters Taruntius (the "half" crater at the left margin) and the bright bowl-shaped crater Asada (slightly below the photograph's centre, "right" of Endeavour). 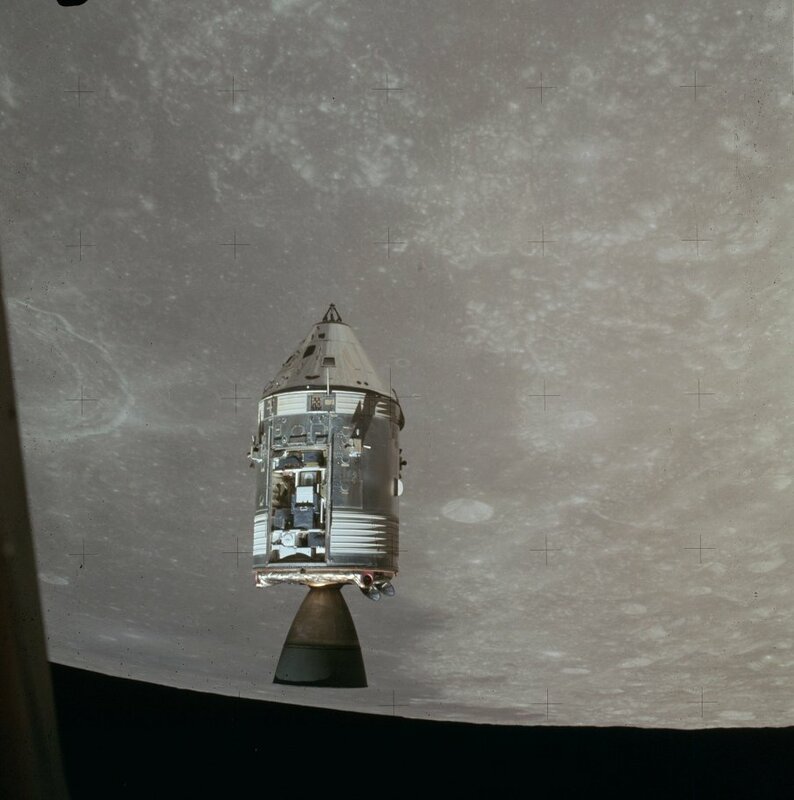 Take also a look at the lower part of Apollo 15's Hasselblad Magazine 88/TT. Research: Danny Caes.